The 3/8" cotton plain color wrist lanyards come with 16-colors available. The hardware are fastened by metal coupler. The cotton shoe string style webbing are comfort to wear. They can be cut to any length to fit your specific application. A safety breakaway buckle on the back of wrist is also available for safety protection or used as an buckle. An optional cord lock can be added to the wrist lanyard too! Either the without custom imprinted or custom imprinted models are available. Any custom size, length, material, hardware attachment, custom logo and custom imprint are welcome! 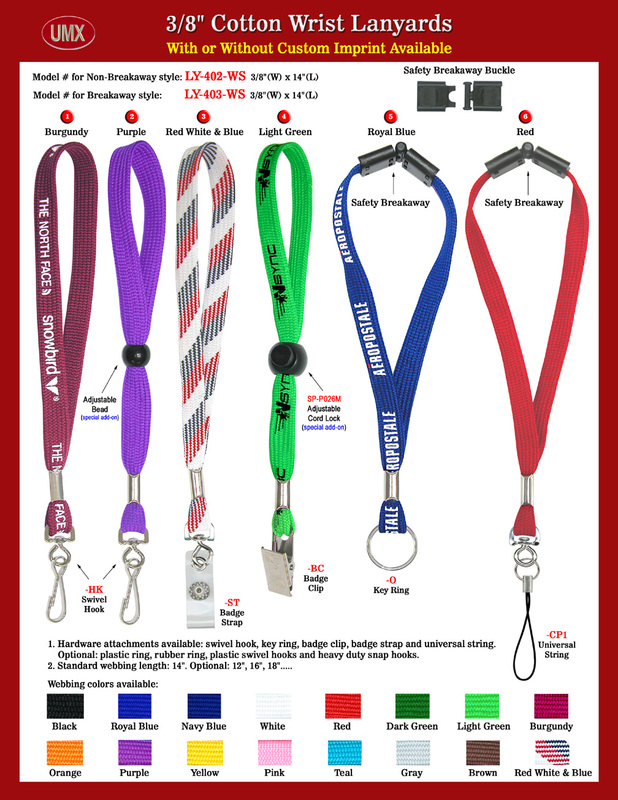 You are viewing Lanyards > Wrist > Custom Printed or Custom Size 3/8" Cotton Wrist Lanyards.